The Vision of First Congregational St. Clair is to be vibrant family that embodies Christ's message of faith, hope, and love. We are often identified as "the church with the clock tower". The tower is 66 feet high and has a clock face on each of the four sides. It can be seen from Canada, and in the days before electronic navigation, the captain and crew of cargo ships used our clock tower as a navigational aid as they sailed up and down the St. Clair River. The tower is still marked on the St. Clair River navigational charts. To this day, the time they pass abeam of the tower is still recorded in ship's logs. First Congregational Church UCC consists of the church building with a connecting education building and a separate parsonage. We occupy an entire tree-shaded city block in downtown St. Clair, about 2 blocks from the St. Clair River. The history of the First Congregational Church of St. Clair dates to1833. In September of that year, Albert Worthington, assisted by Rev. Luther Shaw, organized a Congregational Church of 14 members, in a meeting at the home of S. F. Hopkins. The first pastor was Rev. O. C. Thompson. In 1835, the church was received into the Presbytery as a distinctly Persbyterian Church, but in 1841 was re-organized as the Congregational Church of St. Clair. We are the oldest continuing congregation in St. Clair County. According to church records, in 1836 the pastor's salary was $332.00. 1845 the church had 43 members with 140 in the Sunday School. On September 9, 1879 the cornerstone was laid for the present church on land given by the Hopkins family for the church and parsonage. 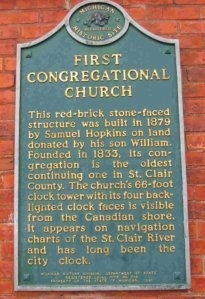 The red-brick building was completed in 1880. The pews were arranged in amphitheater form, and seated 360. According to church council minutes, in 1883, the church property was valued at $15,000 and there were 115 members. In 1901 the pastor's salary was $25.00 per week and the electric bill for 11 months was $20.10. In 1956 we dedicated a new Religious Education wing. 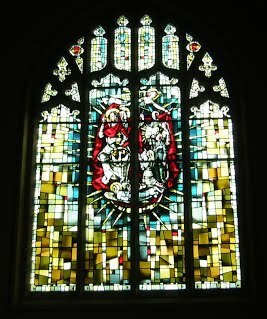 The Mary Moore Memorial window was installed in 1962; its theme is Reconciliation. We observed the 100th Anniversary of the building in 1979 and were designated as a State of Michigan Historical Building. The plaque is mounted on the east side of the building. In 1984 we held a Sesqui-Centennial Year Celebration. In 2008 we celebrated our 175th birthday with special events and wonderful displays about our history.